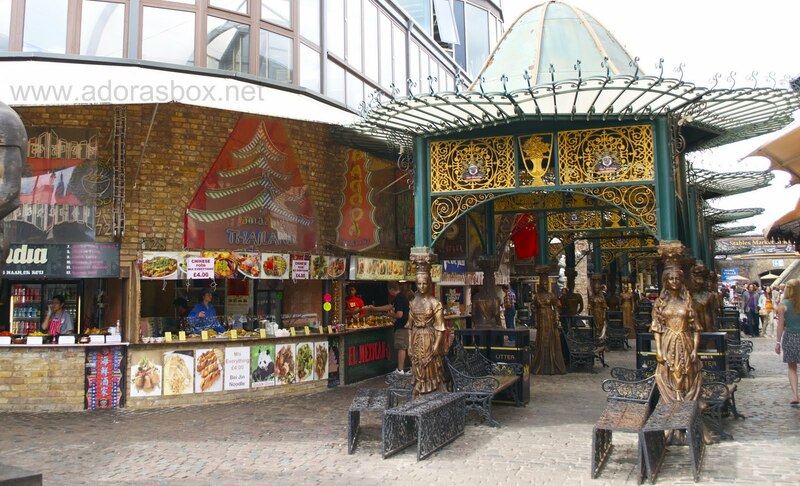 The previous weekend, we took a trip to London's Camden Market, just a few minutes away from our house. It is a very quirky, fun market and I thought you guys might be entertained by some photos. It is located in what used to be the intersection of the main trade routes in the 1800's. It became an arts and crafts market in the 70's and today houses anything and everything under the sun. Food, clothes, ethnic novelties, punk gear and antiques are all housed in this quirky labyrinth that used to house horse stables. 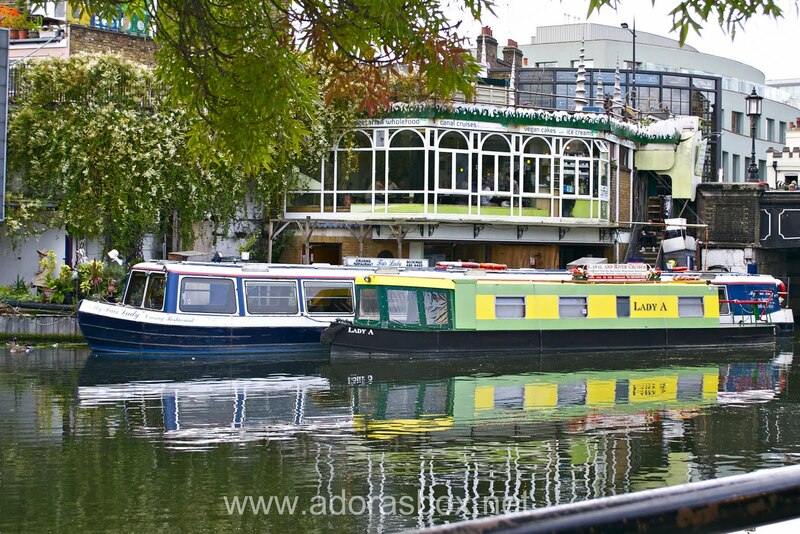 There's also a canal where you can go on a scenic boat ride around London. There are a lot of stalls selling food from different countries, so come hungry. 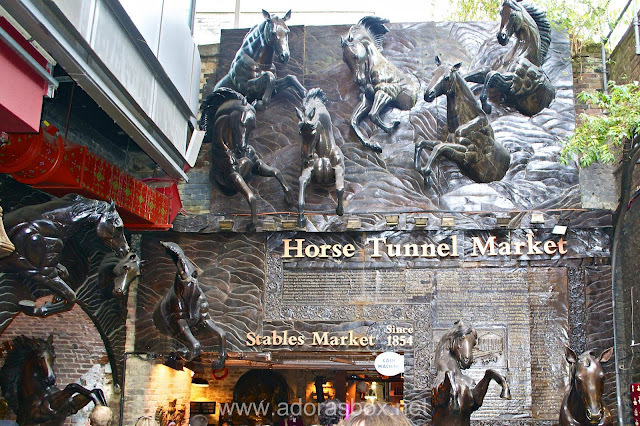 Lots of horse statues in this market that used to house horse stables. English ladies hold up the gazebos that shelter park benches. Next to it are garish food stalls from different nationalities. You can go on a scenic canal boat ride around London. The blue boat is actually a cruising restaurant. 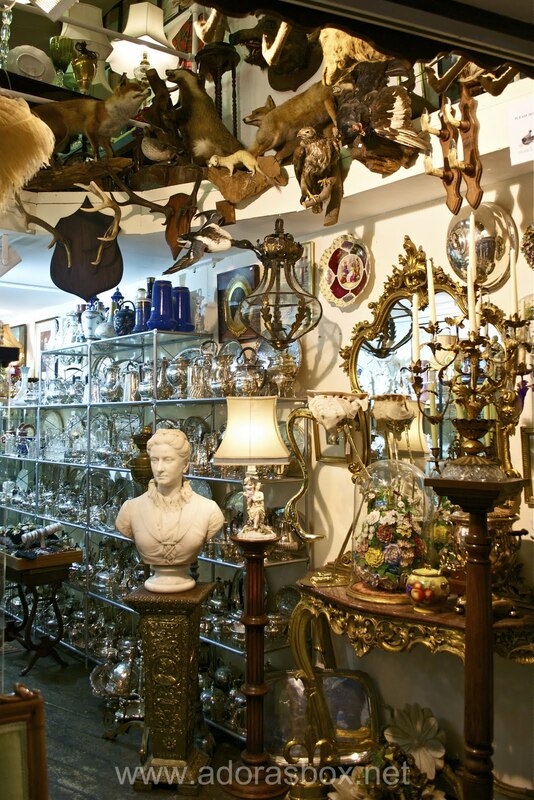 This part of the market houses antiques. For the love of everything English. Antique silver and glassware and some hunting trophies. Sad to say, Asian food is pretty generic at Camden market. There is no divide between Japanese, Chinese nor Thai cuisine. 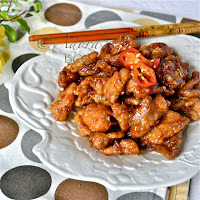 The iconic sweet and sour pork is one of the most popular fastfood item and it pretty much looks the same in every stall. I can't even say that they look appetizing. It used to be one of my favourite dishes as a child. I remember how properly cooked it was. 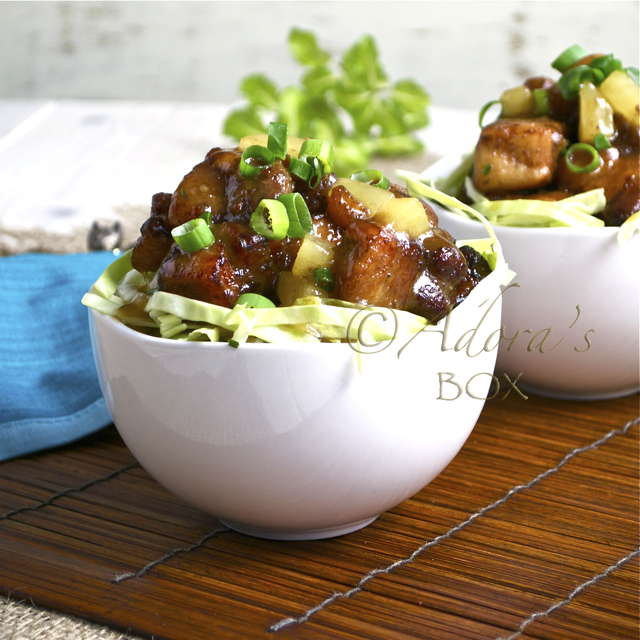 Crisp, starch dusted cubes of pork with a sauce that has the correct balance of sweetness and tartness. It's come so far since commercialism took away all the goodness and changed it to an almost unrecognizable form. My children actually like this dish so I have to compromise. I sliced the pork thinly so I can quickly stir fry it instead of deep frying. The sauce has no thickener and is actually just a bit more than a glaze. Sweet and sour pork minus a litre of oil. Now that I'd happily eat. Season the pork with 2 tbsps. of the light soy sauce, sesame oil and the corn flour. Mix very well then set aside while you prepare the rest of the ingredients. Heat up a wok until very hot. Add 2 tbsps. of the cooking oil and swirl around to coat the wok. 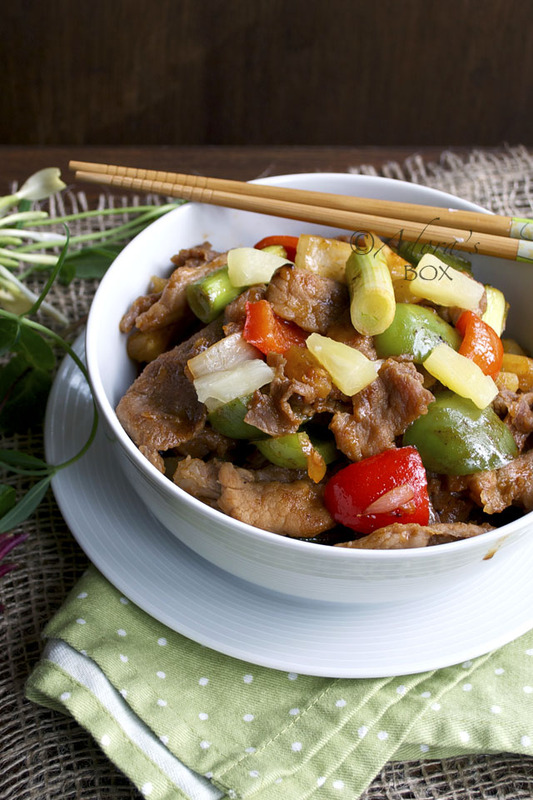 Add the pork and stir fry for about 5 minutes or until the liquid that comes out of the pork is re-absorbed. Add the last tbsp. of oil and stir fry until the pork is glossy and dry. Add the vinegar, ketchup, pineapple syrup, honey, sugar, onions and peppers. Keep stirring until the mixture comes to a boil. Keep the heat high. When the peppers and onions are half done (about 3 minutes), add 1/2 cup of water around the pork to deglaze the pan. Add the spring onions and the pineapple pieces. Simmer for 2 minutes then turn the heat off. Transfer to a serving dish. I know the generic kind of pork dish you mean, but this looks sooo much better! I have the same chopsticks! =) Don't worry I was looking and drooling over your dishes first...then I realized your chopsticks. ;-) This is one of my favorite dish! 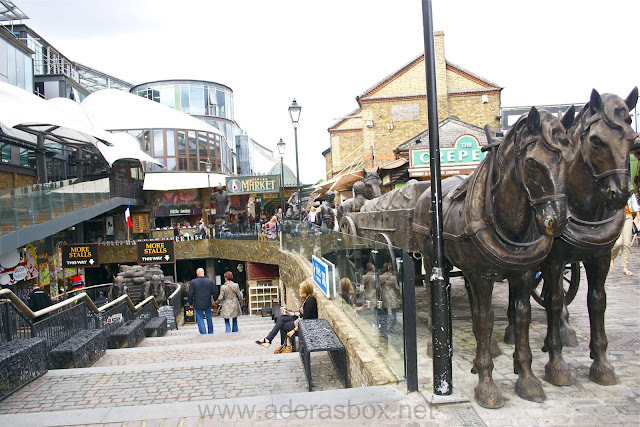 I have such fond memories of visiting Camden market during my trip to the UK 10 years ago... after seeing your photos, I have a real itch to go back again. Soon, hopefully! I've never been a big fan of the heavy breading and gloppy sauce they use on Sweet and Sour Pork in most Chinese restaurants. Your take, on the other hand, sounds like it's right up my alley... must try this out! Camden Market looks very nice. 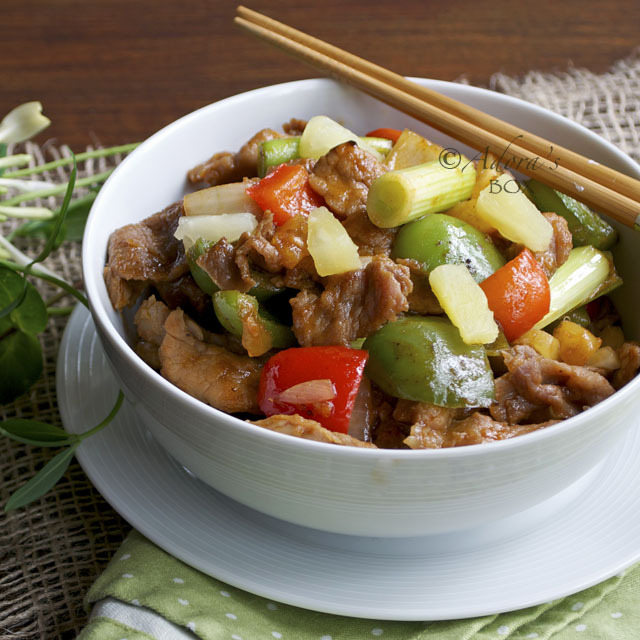 Love the combination of sweet and sour with the pork. I would love to cook it, but I am not sure it it will come out as delicious as yours! What a FUN post! GREAT pictures - thank you for bringing the market alive for us! The Sweet and Sour Pork is stunning! I love love love markets! I can hang out there all day. Maybe one day we can go together! What a great dish! The colors are great and it’s loaded with veggies and meat. JUM! I whole heartedly agree with you. I haven't had good Chinese food since I used to drive into NYC in college and get some. The one place in town, despite the fact that nobody working there speaks very good English, still produce food that has no real discernible flavor and half the time isn't even properly cooked. This I could eat a huge bowlful of!